√ 103°VR View - Stand on the summit of Mount Lyell and overlook the surrounding mountains covered by snow; imagine the wind blowing across your face... Our 103 degree field of view makes you feel like an actual climber, not as a mere watcher or viewer. 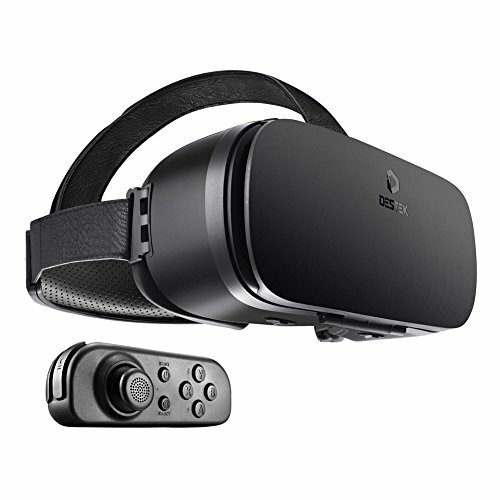 It balances immersion and clarity of view while providing you the most excellent VR view to watch 360 degree video.★★NOTE:★★the remote control of V4 combo can't support Daydream Apps. √ Wide Compatibility - Share one DESTEK V4 with the whole family! It supports smartphones with 4.5-6 inches screen, such as iPhone X 8 7 plus/6s/6/6 plus, Samsung s8/plus s7/s7 Edge/s6/s6 Edge Note8/5/4/3, LG g6 g5 g4 g3 v20, and Daydream phones like Google Pixel/Pixel XL/Pixel 2/Pixel 2 XL, Samsung s8/s8 plus, Moto Z/Z Force, Huawei Mate 9 Pro, etc.